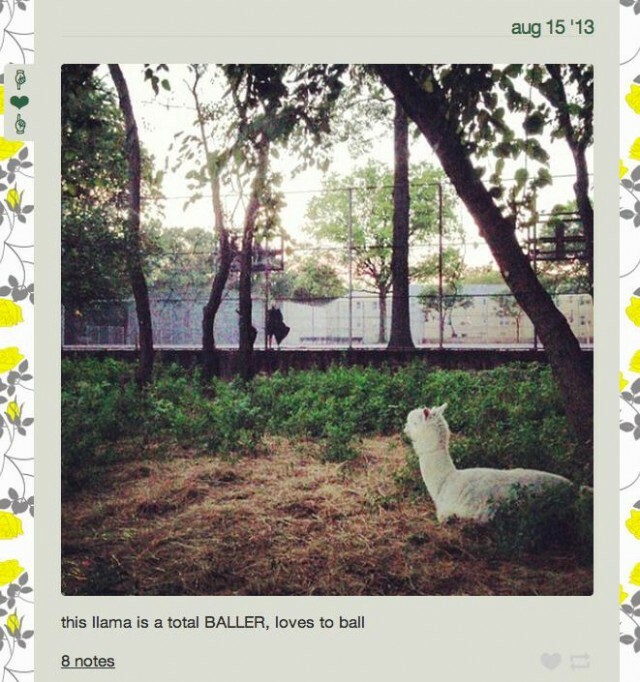 Llamas In New York City: What Is The Deal? People share tiny narratives and enigmatic pictures on social media all the time. Sometimes that’s not enough for us. We like details. So we have to ask. What we know: On August 15th, Lindsey Weber posted this picture to her Tumblr. What we don’t know: Everything else. Lindsey. So what happened here? I was at Queens County Farm Museum up in Glen Oaks for a screening of the new Romeo + Juliet meets Bonnie and Clyde film, Ain’t Them Bodies Saints, by 2011 Rooftop Films grant winner David Lowery. Rooftop set up this big screen (that looked like a bouncey castle) among some sunflowers, and right before the film began, my friend Rae and I ran around to see what animals hadn’t been put inside for the night. We found two mini horses, three pigs, a tortoise, a bunch of chicken and, in front of a basketball court, two llamas just coolin’ out. Were the other giant animals crowding the basketball courts, or was it just those llamas? There were just two llamas in that particular pen, the one that sat right next to the courts. And I was trying to get their attention with some pathetic clucking (what noise do llamas make? I still have no idea), but they were so fixated on the basketball game that they just ignored me. Llamas love basketball? And I should go to Queens more often. Seems like there are some cool things happening up there. The baller llamas didn’t have baller seats, but I did, and the movie was pretty good. See it! Matthew J.X. Malady is a writer and editor living in Manhattan.